I have been using TortoiseGit for almost a full year now. It has been working very well for me until yesterday, when I encountered a problem. I was deleting a folder when Windows Explorer sort of crashed on me (it hung on "discovering items") for over an hour, then I restarted the system. In the open file dialogue of all programs, the icons still exist (!). I changed TortoiseGit settings to show different icons. Reinstall TortoiseGit (uninstall, restart, install, restart). I deleted all icon overlays starting with "Tortoise" in HKEY_LOCAL_MACHINE\SOFTWARE\Microsoft\Windows\CurrentVersion\Explorer \ShellIconOverlayIdentifiers, then uninstalled TortoiseGit, restarted the computer and reinstalled TortoiseGit. I tried to create a new user on my computer, and the new user has icon overlays working just fine. I am now even more confused. Nothing helped so far. Any ideas? So what I did was rename the key 1TortioiseNormal to "1TortioiseNormal" etc. I have no idea why wrapping it inside a double quote makes it work again. The original forum is gone, but a good summary is supplied in the comments. Windows will only allow up to 11 icon overlay identifiers, arranged in alphanumeric order - if there are more than 11, these icons will not be displayed. to make them rank higher. update: for Windows 8, the limit of icon overlays is 15. Remove/delete all SkyDrive/OneDrive keys. You may need to take ownership of the keys one by one and give your user full control if you receive an error while trying to delete the keys. All git/svn overlay icons are now visible ! after a system reboot icons shows currectly. I had this same problem today after uninstalling TortoiseSVN. I rebooted and still no luck so I just went into Control Panel, Uninstall a Program and on the TortoiseGit item I picked 'Repair' and everything is back to normal. I suspect that all of the Tortoise line of apps have some shared registry keys or something. I also had my TortoiseGIT shell icons quit displaying suddenly, I don't remember exactly what led up to it but I found this and tried the registry stuff changing 1TortioiseNormal to "1TortioiseNormal" and so on. That is probably a good thing to do no matter what but icon overlays were still not working. I am too busy for the blanket answer of "restart the computer" what that says to me is "some service process needs to be restarted but you'd never be able to find it so just restart." Nah. I also use TortoiseSVN and those icon overlays were still working for me. I looked in my processes tab of task manager and saw I had something called TSVNCache.exe running. No sign of anything similar for git, so on a whim I went over to the applications tab and hit "New Task", entered TGITCache.exe and sure enough that process fired up. From there go back to processes, kill explorer.exe, then go back to applications -> New Task again and fire up explorer.exe. This has worked for me twice now when my TortoiseGIT icon overlays have quit, so, maybe it will work for someone else. I had installed TortoiseSVN (1.9.5) and msysgit (2.11.0) first on my Windows 10 64-bit machine. TortoiseSVN icons displayed fine. When I installed TortoiseGit (2.3.0.0) after these two the icons wouldn't display. I checked HKEY_LOCAL_MACHINE\SOFTWARE\Microsoft\Windows\CurrentVersion\Explorer\ShellIconOverlayIdentifiers and all looked fine. The tortoise icons were in the top 10. 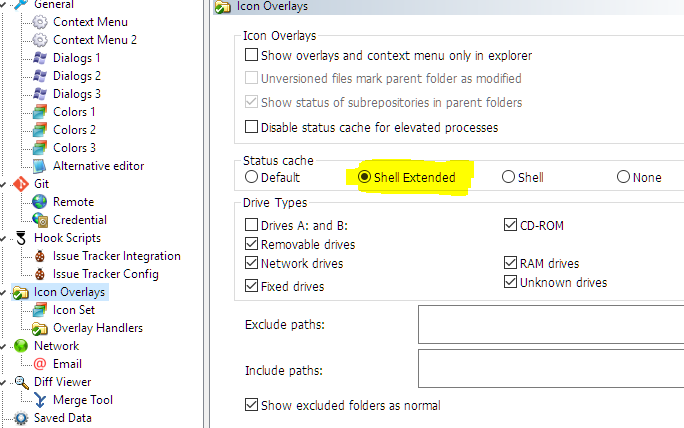 Add a new string value "Max Cached Icons" with value "2000"
closed/restarted explorer and icons display! What worked for me was to uninstall Google Drive from my computer. Not sure why yet. The problem with the leading spaces is that every time you reboot, Dropbox adds another space to its registries, and will be always one step ahead of you. So I've scheduled a python script found on this post (by Christoph Zwerschke) to execute every time the computer boots. You also have to restart the Explorer after that. I Agree with Chi Chan and I would like to add this as an complementary answer. It's Dropbox Explorer icons. Here is a registry script to remove them. Save it somewhere, because they will come back! Note, that the values change from time to time, too. Currently they have 3 spaces before the "DropboxExtXX", before they had only one. Make sure to add your projects folder to the "Include Paths" box. Not the answer you're looking for? Browse other questions tagged git tortoisegit or ask your own question. ShellIconOverlayIdentifiers - why so few? How do I show my global git config? tortoisegit delete does not delete?